You'll be on a lake with a stay at Changa Safari Camp in Matusadona National Park. Featured amenities include dry cleaning/laundry services, luggage storage, and laundry facilities. A roundtrip airport shuttle is provided for a surcharge (available on request). Located in Dete, Hwange Safari Lodge is in a national park, a 3-minute drive from Painted Dog Research Center and 10 minutes from Hwange National Park. Free self parking is available onsite. 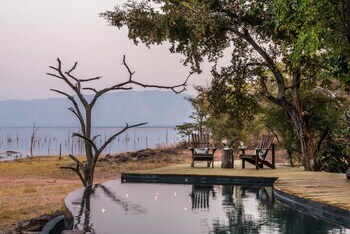 Located in Victoria Falls, Jafuta Lodge is in a rural location and within the region of Victoria Falls National Park and Zambezi National Park. Free self parking is available onsite.